Official description Kirbys galore...each with a unique copied ability! Puffballs Unite! (ピンクだま祭り, Pink Ball Festival) is the 28th event match of the 51 event matches in Super Smash Bros. Melee. 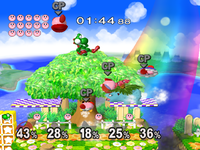 The player can choose a character to defeat 14 Kirbys (4 at a time) on the Green Greens stage. This event match is similar to the match in Adventure Mode, where each of the Kirbys is wearing a Kirby Hat, giving every Kirby a unique neutral special move. The Kirbys in this event are heavier than in Adventure Mode. This event has a rather strict time limit of 2 minutes, where the event will end in failure if the player fails to KO every Kirby within that time limit. This page was last edited on July 21, 2018, at 17:28.